I’ve eaten plenty of barbecue in my time. When I was a youngster and visiting my folks in Texas, we’d favor a barbecue joint on the south and west of Forth Worth with sawdust floors. 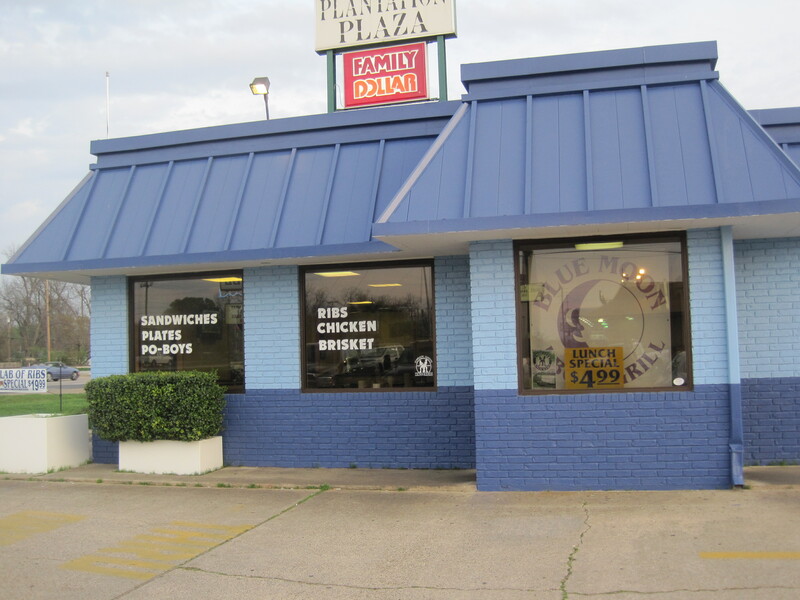 When I lived in Houston for grad school, Goode Company Barbecue was my favored hangout. In Saint Louis? There were some fine K. C. Masterpiece stores. In Durham, North Carolina, I was introduced to Brunswick stew and Carolina style ‘cue. While living in Florida, I had some of the best ribs I’ve ever eaten, smoked forever, at a small joint near railroad tracks in the greater Orlando area. I learned most of what I know about smoke, though, from the original owners of Spiced Right Barbecue. In Atlanta, where I do most of my blogging, I can name at least six first rate barbecue joints: Fox Brothers, Big Shanty Smokehouse , Heirloom Barbecue, Grand Champion Barbecue, Community Q, and ironically, Hottie Hawgs can bring it at their best (make that 7: Mad Dog’s is also quite good). What do the best barbecue joints offer? 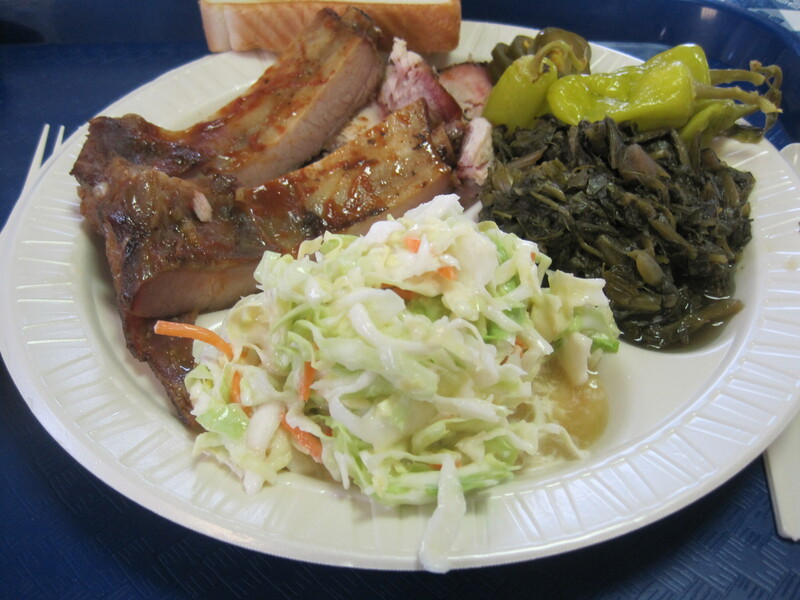 Usually they have consistently smoked meats, excellent sides, and they rarely run out of product as the day goes on. They know their audience well enough they don’t often get caught with their pants down. Smoking meats a long time limits the quantity of food you can prepare, much more so than creating “fall off the bone” ribs, which could be done in a pot of water over the stove, in an oven, or perhaps by sous-vide, with a quick finish on the grill. Silver Star's brisket plate is a winner. Coming from Atlanta, I have plenty of people I can talk to about barbecue, such as Mike Stock of 285 Foodies, David Jones of Eat Buford Highway, and Dustin from Georgia Barbecue Hunt. Some of my reference points are no longer in Atlanta: 3rd Degree Berns is up in New York these days. I just want people to have a clue when I start talking about the Silver Star. I went there during my high school’s 25th class reunion. I hadn’t seen some of these people in decades, and we had a long table in this restaurant that we filled; perhaps 30 or more people were at our table. However, there were tables longer than ours and they were full as well. The place was packed. One of the many lovely staffers at Silver Star. Geaux Tigers! 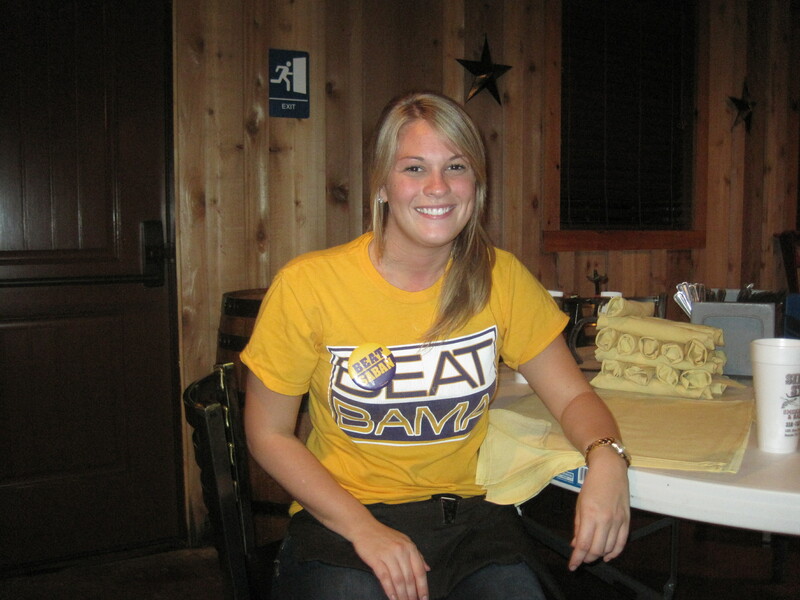 The date: it was the first LSU-Alabama contest of 2011, and many of the staffers were in gold shirts with purple trim. It wasn’t hard to see who the crowd was rooting for. The point I’m trying to make is that this was about the worst possible circumstance to see the best possible food this eatery can deliver. I know the Silver Star folks are paying attention to their ‘cue. You don’t invest in a competition smoking rig and leave it outside your restaurant simply to let it rust in the rain. 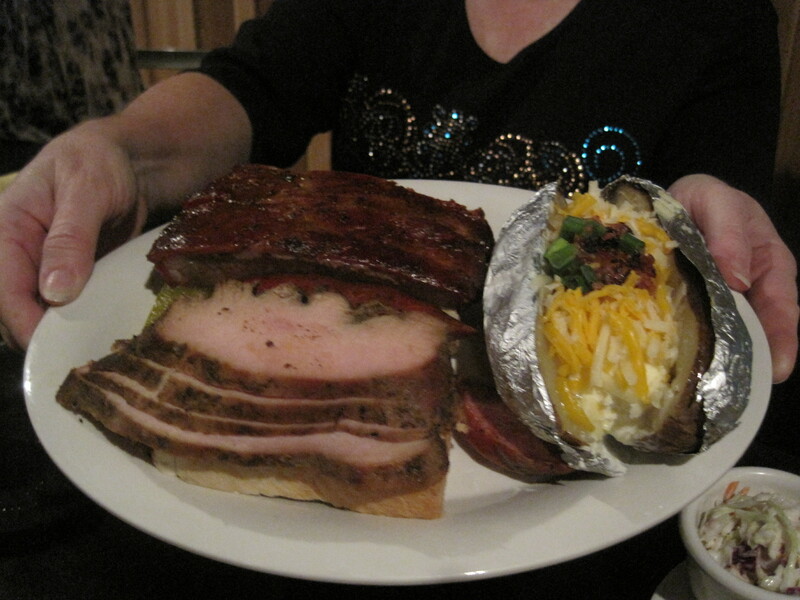 Two meat plate, with a loaded potato. Mixed plate. 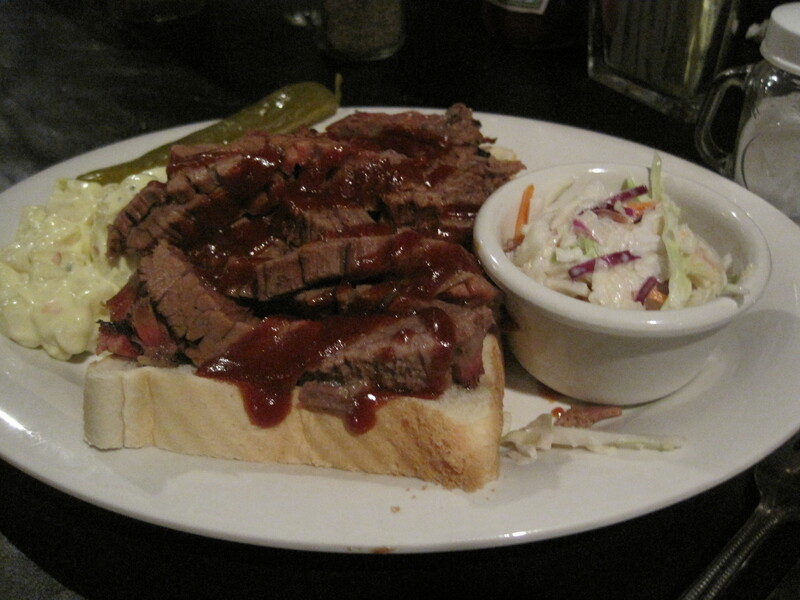 Only the brisket impressed. 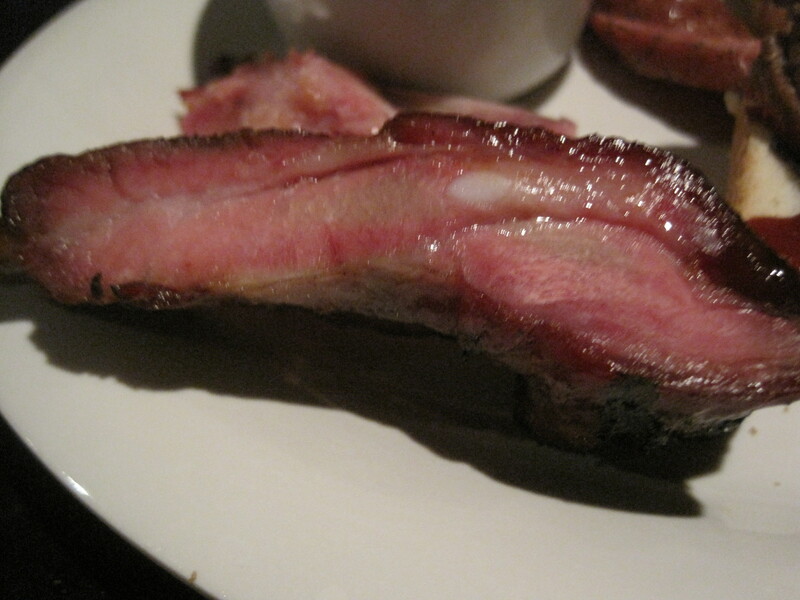 Side shot of a rib, looking for a smoke ring. That said, I had a mixed plate, with 3 meats, and only one of the meats was good enough to be culinarily significant. I had brisket, sausage, and ribs. The ribs were simply ordinary, and it was hard to tell if they had any smoke at all. The sausage was sausage: good, but again, hard to tell if it was a smoked product. The brisket was quite good, had a visible smoke ring, tasted like smoked meat, and delivered the kinds of flavors I expect from brisket. The best way to test the rest of their meats would be to come back at lunchtime, on an off day, when they are seriously smoking, and try their food out. Ribs run out quickly. And when they do, it’s a significant event. The chef at Fox Brothers came out one day, spoke to my wife because she got the last rack of ribs they had (it was a mid afternoon meal, iirc). In discussions with the chef, owner, and manager of Hottie Hawgs, I know they have “competition” style ribs and “sneaky ribs”, and the latter rely on tenderness and sauce. HH uses them when they can’t supply huge quantities of the “good stuff”. I’m a little puzzled why a place that competes on a BBQ circuit would have such an inconsistent product, though. I’m going to chalk it up to the sheer volume of customers that day. I really can’t do anything else. Other bloggers are high on their steaks, but a perfect steak is much easier to make than good cue. Service was really good, considering the crush the Silver Star had that day. It can handle large crowds, and feed plenty effectively. But, just my ought two, if you want their best meats, come when the crowds are small and you can see the smokers working. You’re more likely to run into a consistent product. It’s a pretty blue building along Barksdale Boulevard, near Johnny’s Pizza and close to my father’s new digs. I was curious about the restaurant, because, in all honesty, I was getting it confused with Full Moon BBQ in Tuscaloosa, and hadn’t sorted out the differences at the time. BBQ is always worth it when it’s good, but finding good BBQ is never easy. 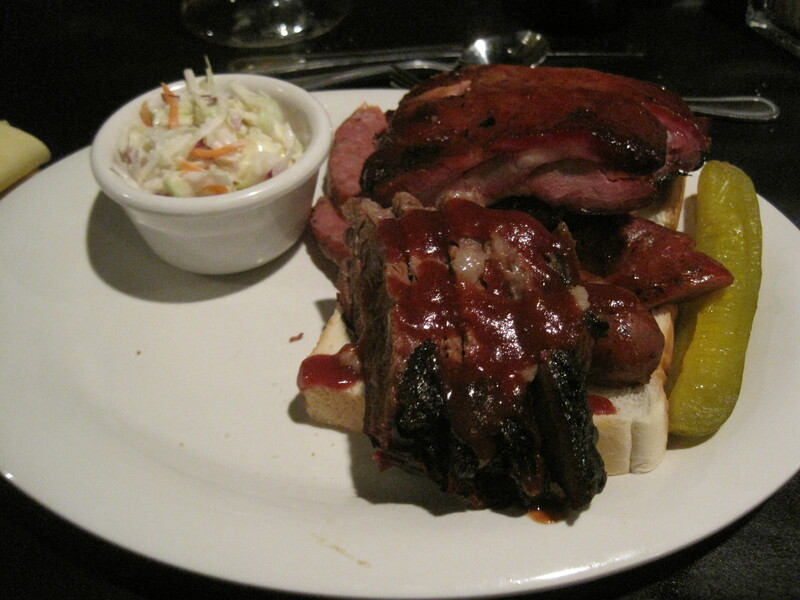 Simplified, there are two kinds of barbecue eaters. There are those who want richly smoked meats. And then there are those who want their meats fall off the bone tender. I’m more in the former camp, as Spiced Right in Lilburn GA spoiled me. The original owner of Spiced Right was a competition smoker. His ribs were simply phenomenal. I recall going through a line, selecting meats, thinking the prices were good. I had some ribs, and the pork was cut up into tender chunks of meat, unlike the shredded pork found in Georgia. The sides were good, the greens in the southern style. Fine sides, decent meats. Would have preferred a more richly smoked product. The meats? Smoked, but it was hard to tell. Tender, yes, but so barely smoked as to almost be indetectable. The meats were tasty, the sauces decent, but if you’re a BBQ head and looking for the best, there are better BBQ joints in the Shreveport Bossier area. It’s a modest restaurant in a strip mall at the corner of Texas Street and Benton Road, and one that has steadily acquired a substantial reputation. The owners of Kim’s appear to be Vietnamese who came from New Orleans as a product of the Katrina disaster. The culinary basis of this restaurant is founded on two solid traditions. You want napkins? Kim's has napkins. Kim’s is a classic strip mall hole in the wall. You order at a countertop before you sit. The menu is a whiteboard above the cash register. 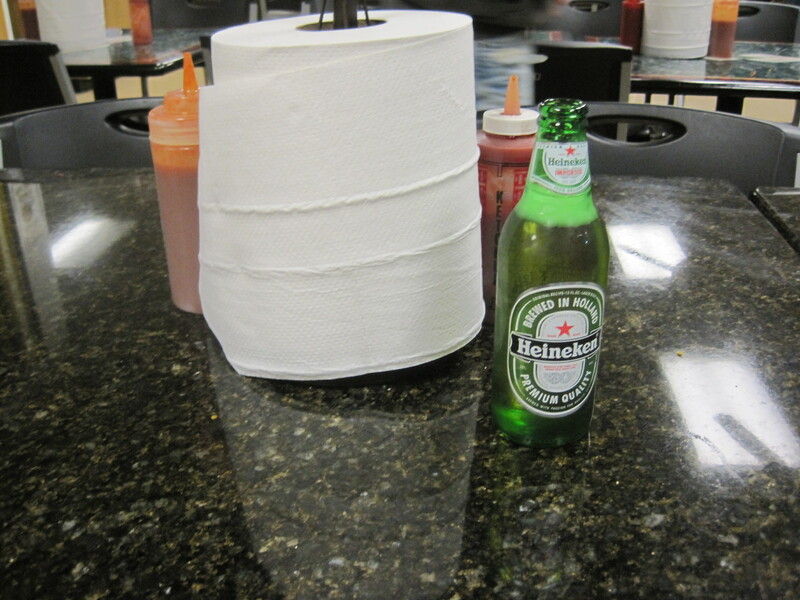 Napkins are a roll of paper, that you can tear off at will. Chairs are made of hollow metal. 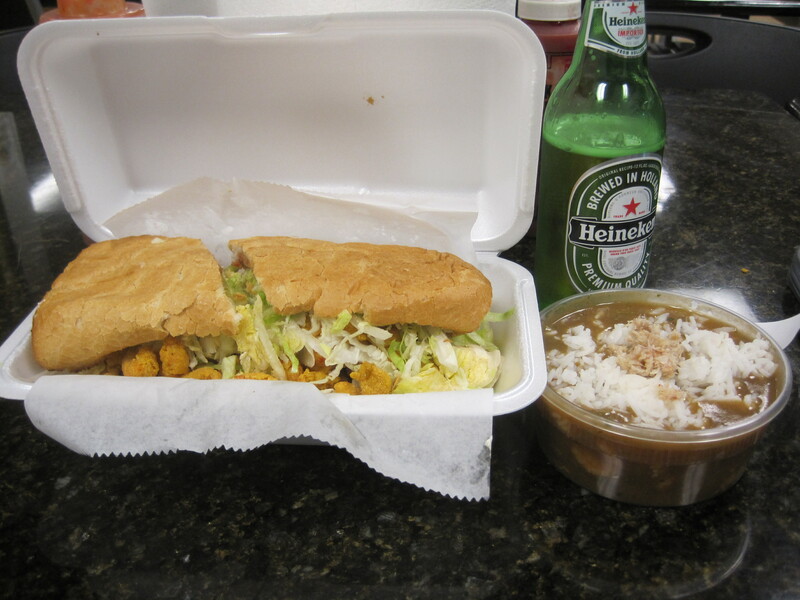 The po boy featured good bread, and small dry spicy crawfish. The gumbo was disappointing. Too much rice and not enough meat and broth. I honestly made a mistake when I came here. I ordered the crawfish po’ boy, which while good, just didn’t wow me. A lot more happy, almost buried in their food, were the folks who had ordered boiled crawfish. People were ordering and eating those by the buckets. To note, there are also boiled crawfish places in Atlanta (Crawfish Shack and New Orleans Seafood) run by Vietnamese who learned Cajun cooking along the coast, and the crawdads at Kim’s seemed a little pricey to me. I can get them for about $3.00 a dozen cheaper in the ATL. Note: The owner Duc thinks my pricing is the product of a mistaken memory, and he notes that as of March 2012, his crawfish price is 4.49 a pound. That said, I don’t know Kim’s costs, the volume they serve, the quality of the fish. I didn’t get to those. The po boy had plenty of tasty crawfish (though small) and was a fair serving of food. 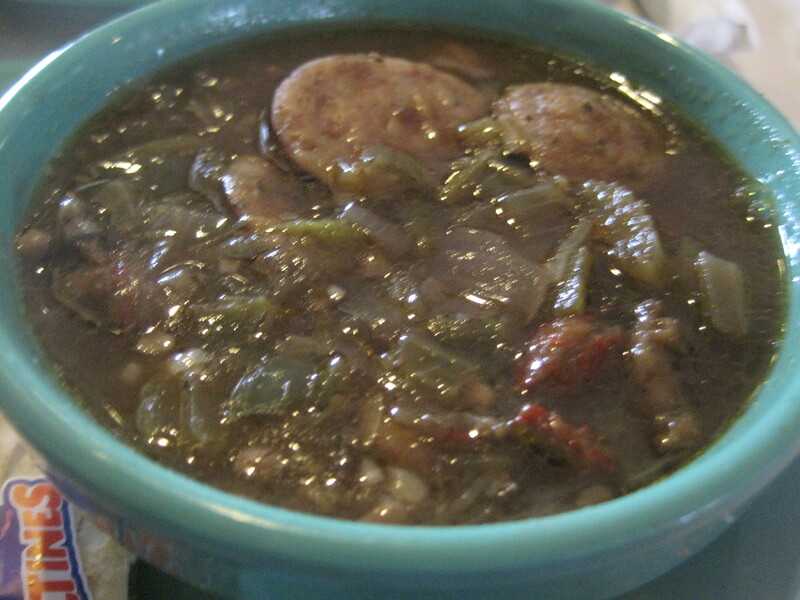 The gumbo was almost pure rice, wasn’t particularly impressive, and I wouldn’t order it again if I ever went back. Boiled crawfish are the king here. The po boys are just decent. Fig is a pretty restaurant on McFarland, just a few minutes north of the Interstate. 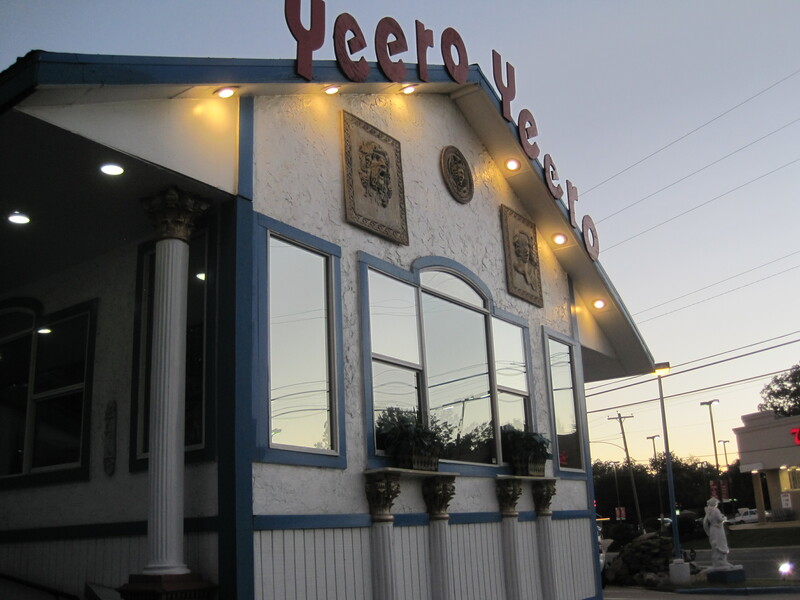 I had been aware of this restaurant for months, but every time I had traveled, this place had been closed, until my recent trip to Texas. 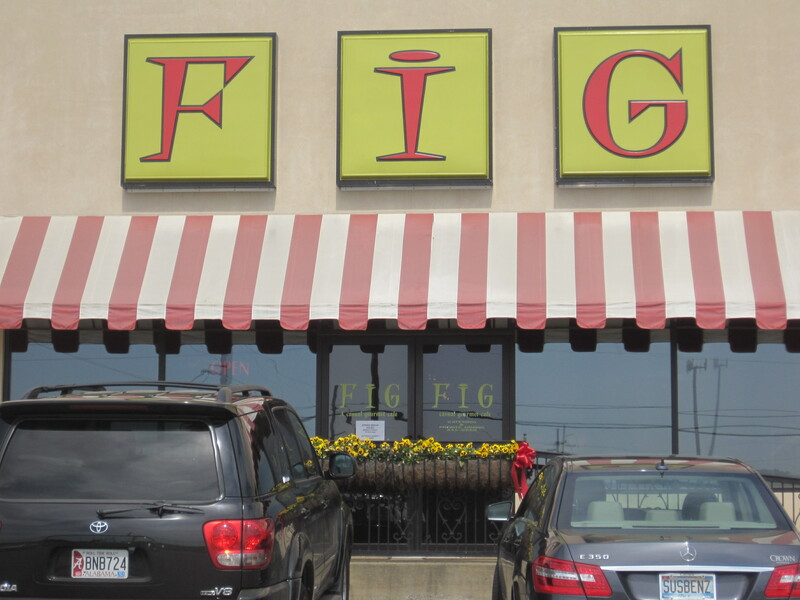 This time, Fig was open, and I made sure I stopped on the way to relatives. Fig is a small shop with an original menu. 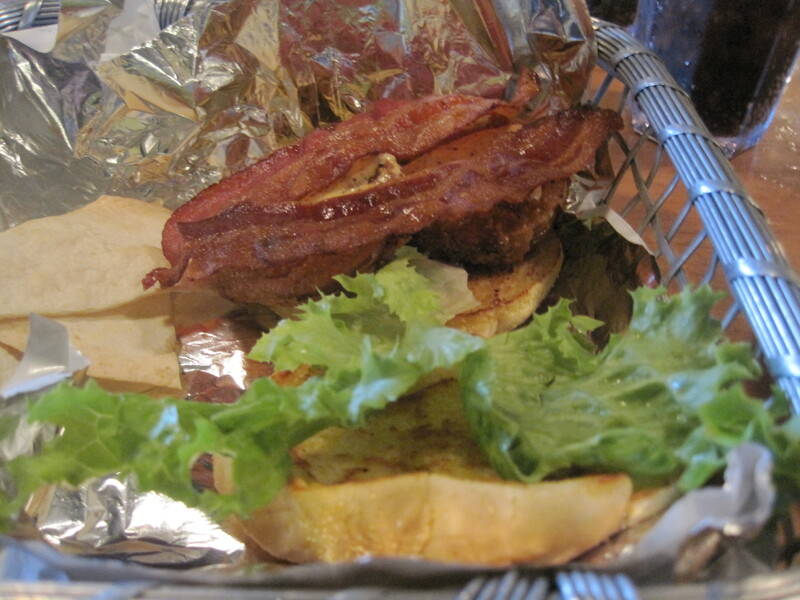 The sandwiches were enticing, and I chose one, a bacon, lettuce, and fried green tomato sandwich. If there ever was a southern riff on the BLT, this is it. Bacon, lettuce, and fried green tomato sandwich. The sandwich was enjoyable, the tart of the green tomatoes an interesting contrast to the normal slice of beefsteak tomato. The plating is good here, service is good and the staff a delight. If you are traveling, it is well worth the time to pause, take a few minutes to head north, and try their sandwiches. It’s one thing to have a good, easy to access bar and grill alongside an Interstate. 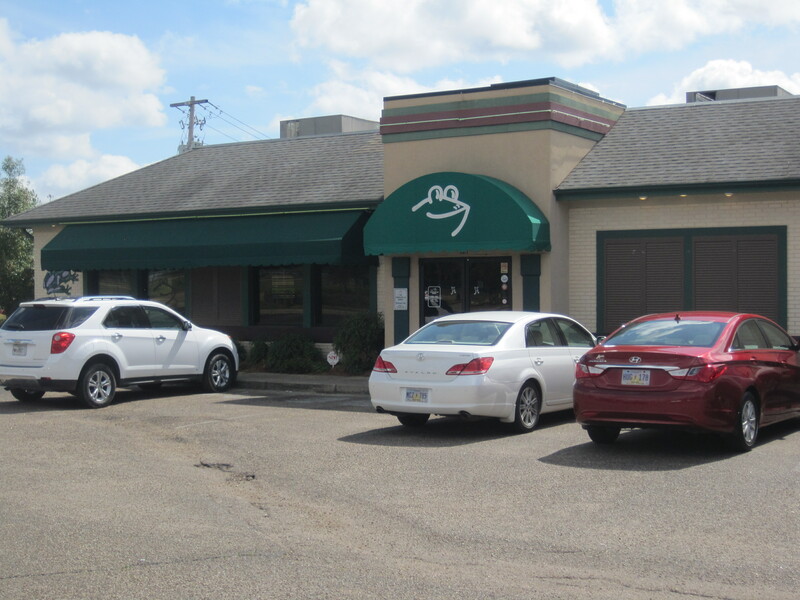 It’s yet another to have one with local ownership, an original menu, and above average food. That’s what Clinton MS has, just off exit 36 on I-20, in the Froghead Grill. 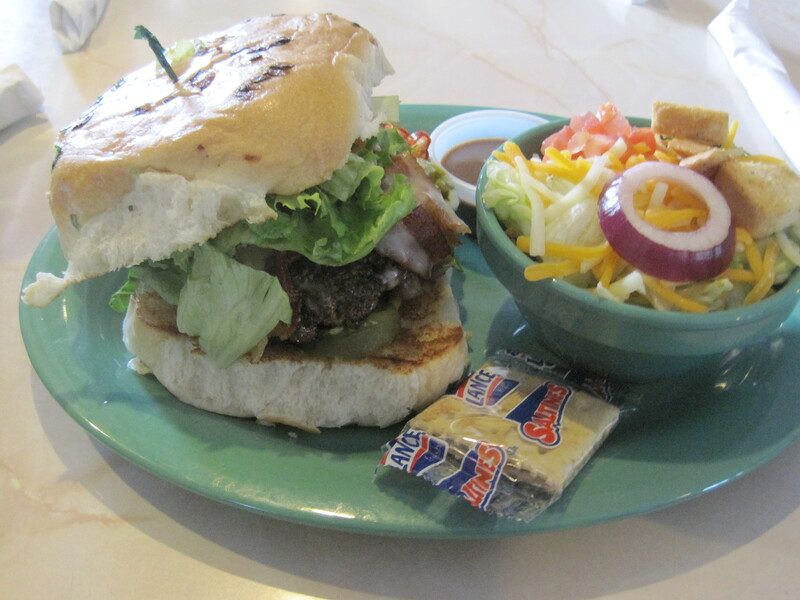 Yes, you can find bar staples such as burger and quesadillas here, but it’s the Cajun touches that stand out to me. The gumbo? One of the better I’ve had. There was no need to add any spice to that mix of sausage and crawfish. The burgers are oversized and juicy. The burger choices in general are creative (they have a version of SpongeBob’s Crabby Patty), and feature interesting bread on the bun. Good gumbos are hard to find, and this is a good one. If you’re a foodie, and tired of the chain scene, this is a stop on the way to Louisiana or Texas to mark down and find time to enjoy. I did. It was well worth it. This wasn’t a place I would have chosen, but one my father had visited, and one for which he was wanting another opinion. Some friends of his just loved this chain. Others could take it or leave it. He felt, in advance, that it was pretty good, but hardly divine. 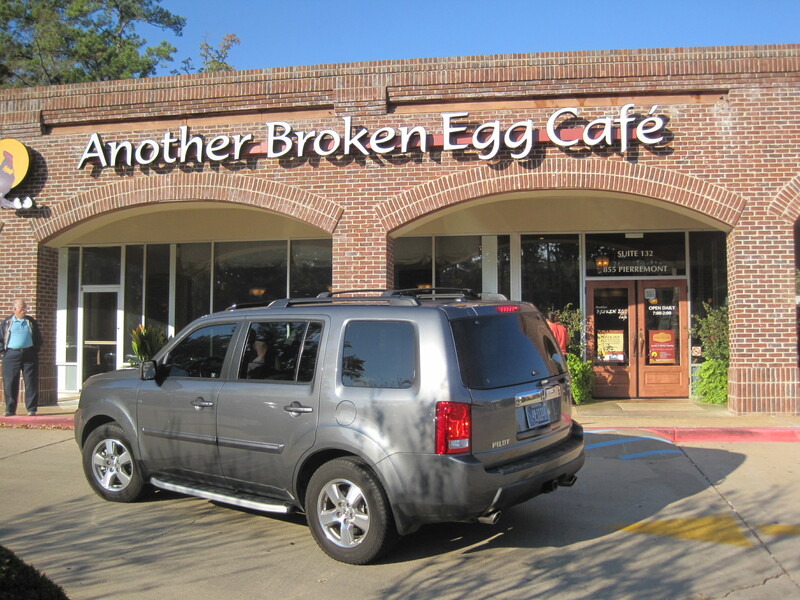 Another Broken Egg is a small chain, and the morning we went, was full of people. 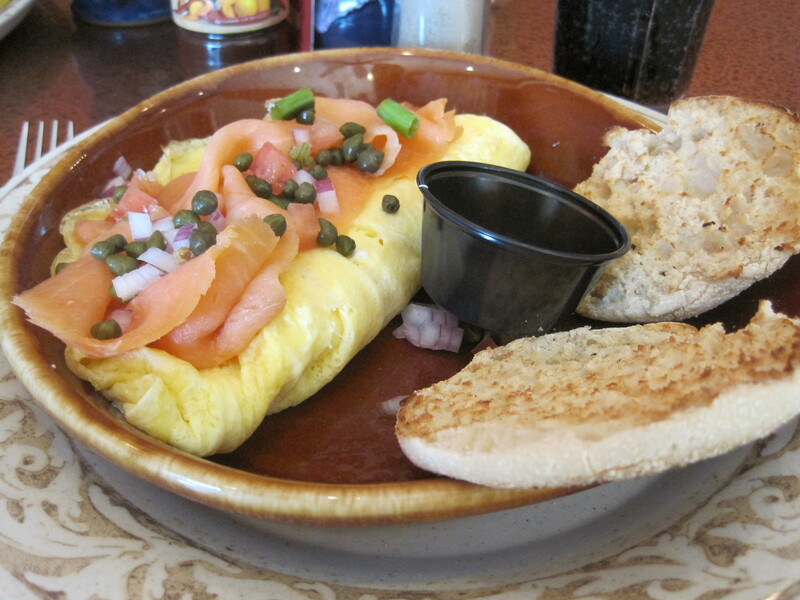 I enjoyed my breakfast, a smoked salmon omelet. 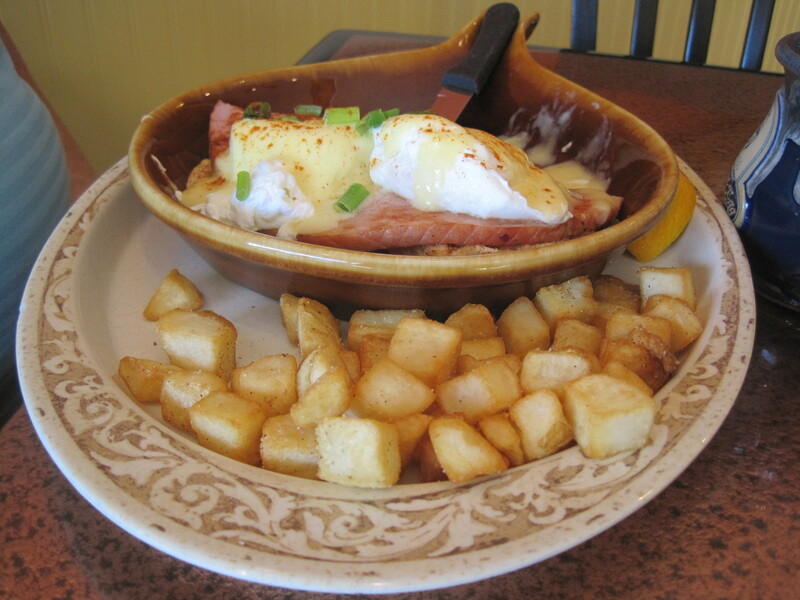 My father’s order, eggs benedict, was made using ham instead of the Canadian bacon he prefers. He liked it but it wasn’t, in his opinion, heavenly. That takes a good hollandaise sauce and the right ingredients. The service was good, so I’d tend to the view that this is a good, not great deal for breakfast. 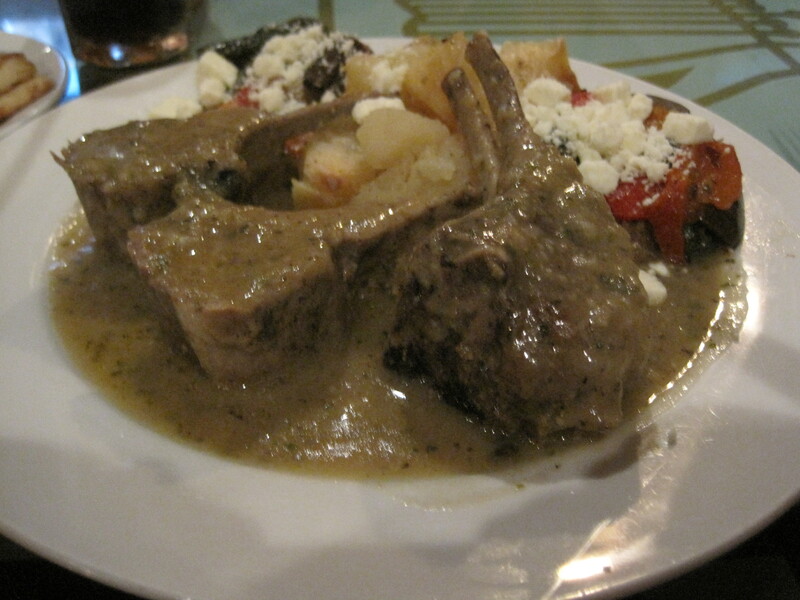 It’s the best known of the Mediterranean restaurants in Shreveport, and one I’ve been curious about for some time. From the outside it looks like a hole in the wall, and most of its business, the day I dropped by, was through a drive through window. Inside, though, it’s nice, with heavy expensive furniture dominating the scene. It is actually pretty small inside, so if you’re coming during a rush, you might not get inside seating. I had their lamb chops and my dad had their muffuletta. 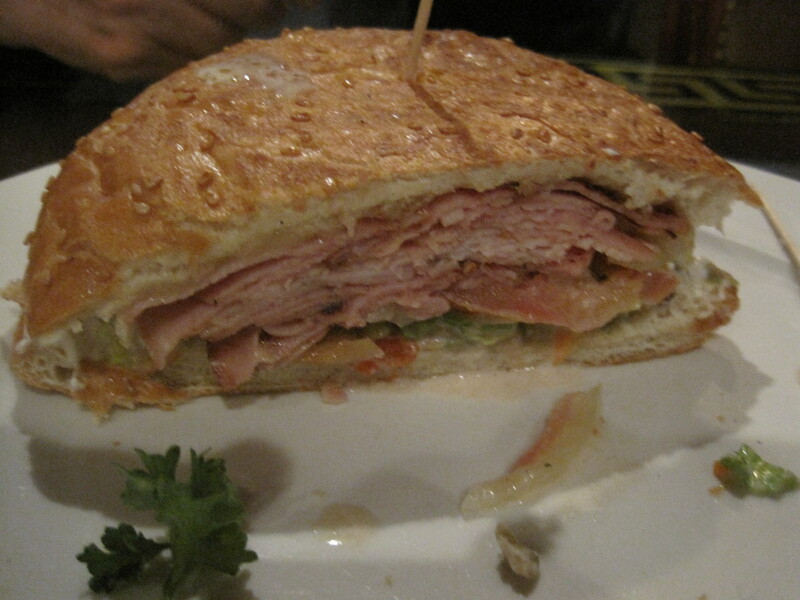 It was a big muffuletta with a traditional seeded bun. I liked the chops, enjoyed what I ate, but the contrast from the modest take out window to the luxurious inside is really tangible.